Reasons to be cheerful ... and there are lots of them at this time of year ! It's nearly Apple blossom time - the best bit of the whole year. If that isn't a reason to be cheerful, I don't know what is ! Our new beech hedge, planted as bare root in march, is poised on the brink of unfurling its leaves. At this stage all look healthy, thank goodness, although we have been carrying cans of water right down the garden, to keep them watered. 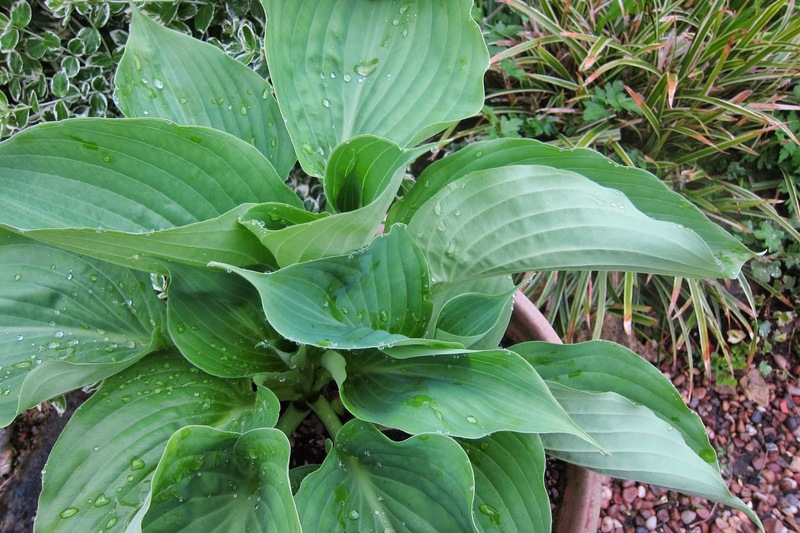 I'd better whisper this bit, but so far the slugs and snails haven't detected the succulent growth of the hostas, and the leaves are whole and unblemished, with no bitemarks taken out yet. SSShhh! I'm giggling with glee ... the glorious Pulmonaria 'Blue Ensign' is in full flower, with pure cornflower blue blooms peeping out from under a conifer. Turn a frown upside down ... my dahlia tubers have nearly all made it successfully through another winter, and are putting on growth, ready for planting out when all danger of frost is over. I overwintered them in the greenhouse, which you would think was sufficient to keep them alive, but I have lost all Dahlia tubers some years, when the temperature has dropped really low. There is a mix of varieties here, but they are all dark flowered, in shades of purple and maroon. The beds and borders are filling out, and areas of bare soil are diminishing. This means that weeding is diminishing too! Hurrah! Many plants are growing strongly now. The Euphorbia is at its best, well-shaped and not leaning drunkenly to one side, as it tends to do later in the season. Spring pots and tubs are at their best now. 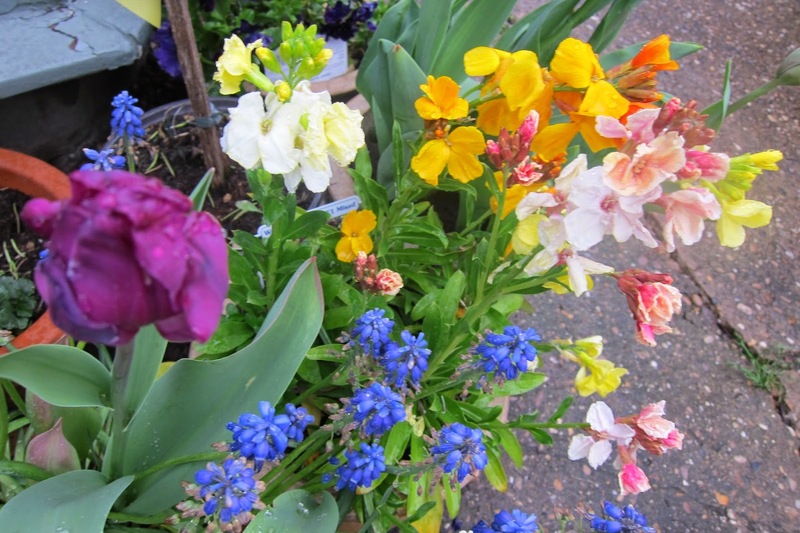 Muscari, tulips, wallflowers and primulas are at their peak. 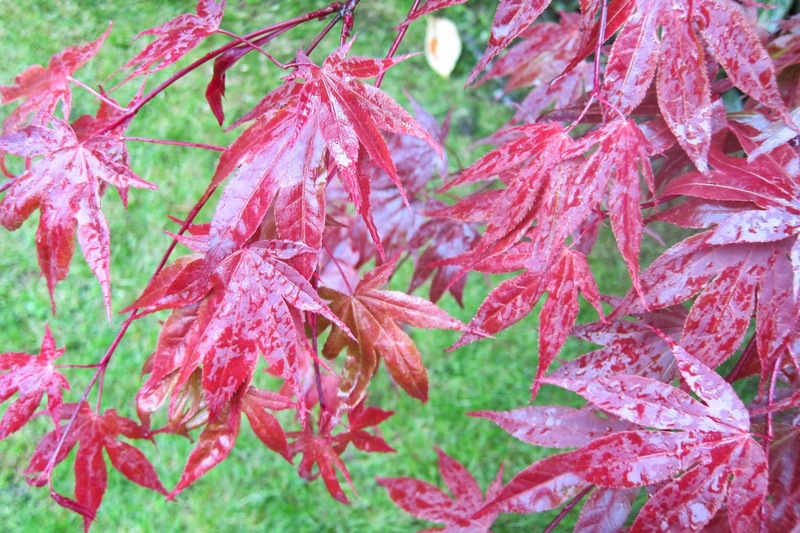 The tender new leaves of Acer Palmatum are all unfurled, showing clear, strong colour. 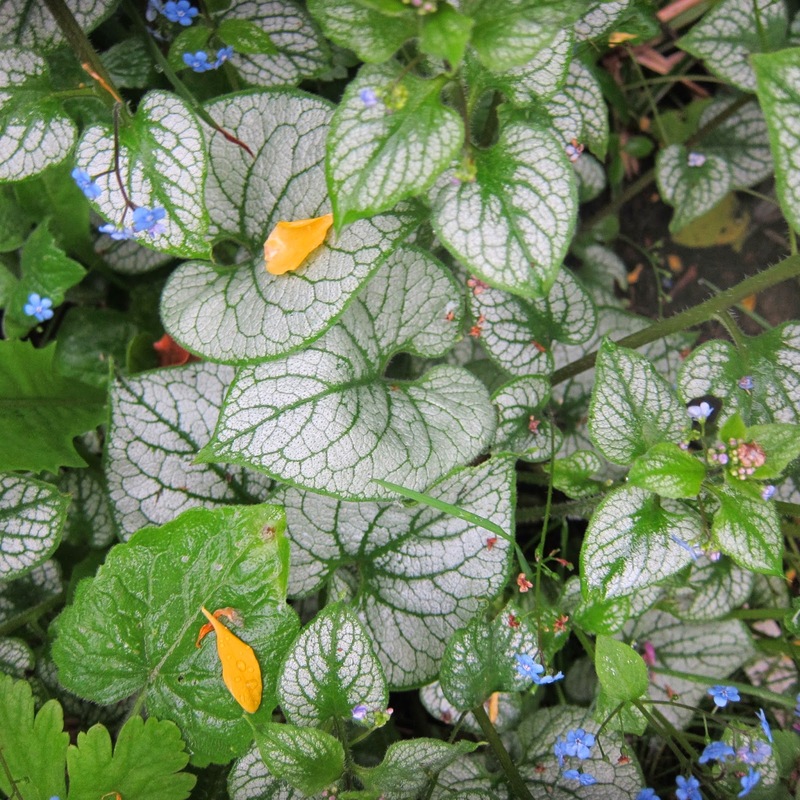 The leaves of this Brunnera just get larger and larger as the days go on. It will be a stalwart of the garden until Autumn now. Fantastic foliage AND a shade lover. Cheerful! I'm nearly bursting with cheerfulness now! There are some happy accidents as far as planting goes ! I am happy with this grouping, which brings together an interesting mix of colour, shape and texture, I think. There are many unhappy accidents which have escaped the camera !! These miniature 'Rosa garden Party' were grown from seed sown in January this year. 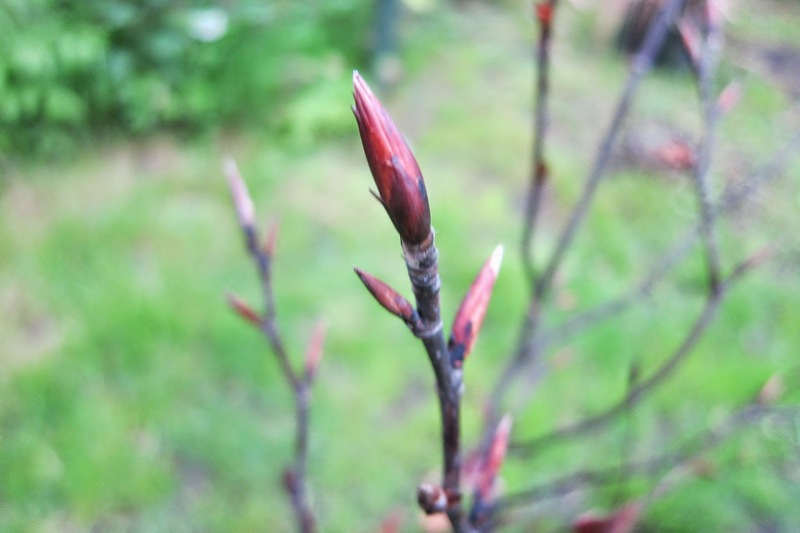 The instructions stated that if the seeds are sown early enough, then they should flower the same year, and these young plants are starting to flower already. 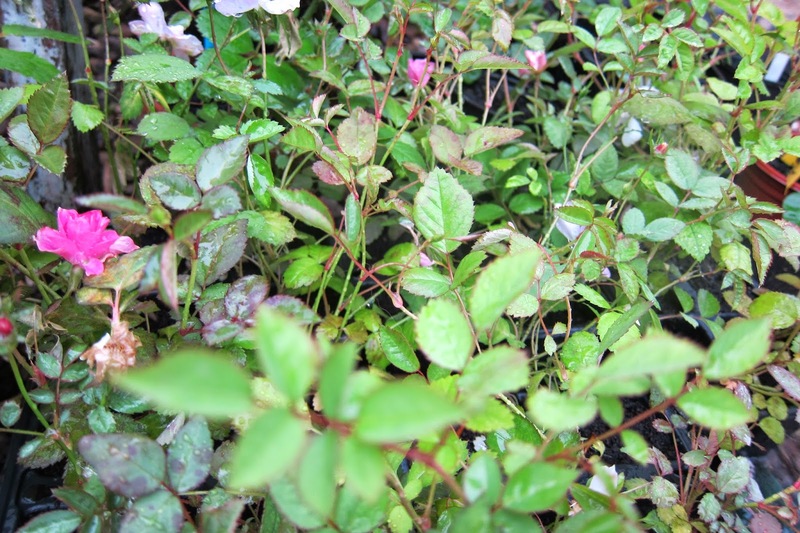 They are really healthy and I have started planting them out as edging to borders/ underplanting larger roses. 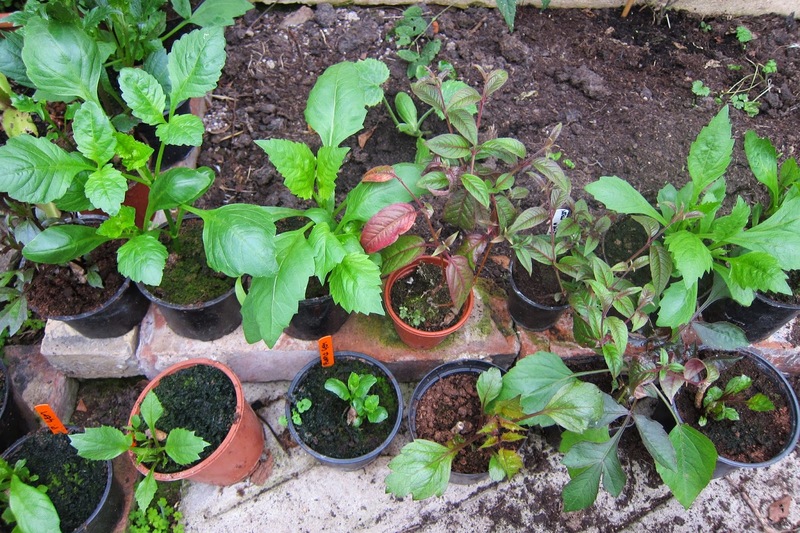 Interestingly - and definitely a reason NOT to be cheerful - I bought 72 as plug plants last year. they were fantastic, and performed really well, but have developed powdery mildew due to the wet conditions over the winter. Any suggestions, please, as to how to get rid of this ? I am hoping drier conditions and new growth will overcome the problem, but it is not happening yet. Another reason to bubble with happiness - Magnolia Stellata, the elegant, less blowsy cousin to Soulangeana, continues to bloom. I planted about a dozen bare root Patio roses in early Spring, and all have taken and are doing well. 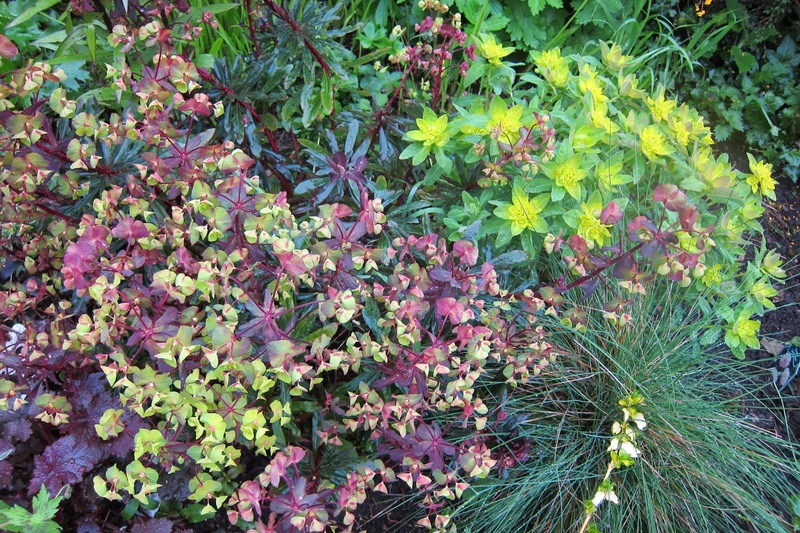 This is 'Sweet Dream' and it is showing healthy foliage and a pleasing compact habit. 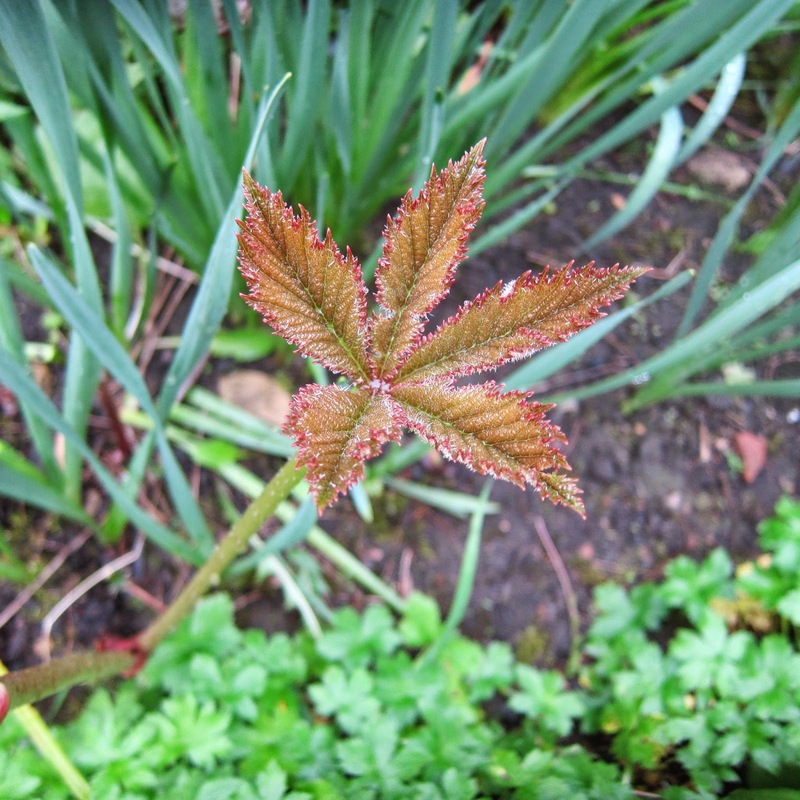 The first leaves of Rodgersia have appeared over the last week - always good to greet old friends ! Giddy with euphoria now ... the tulips are centre stage now, mainly pinks, purples and creams. Life has returned to the ponds and they are seething with frogs, tadpoles, beetles, pond skaters and sticklebacks. As the water warms up the plant growth is kick started into growth,and all the marginals are making an appearance again. The Marsh Marigolds are out, making a sharp pop of yellow. But it's not happy smiles all the way! Although there are many, many reasons to be cheerful, there are also reasons to pull a sad face! This is a bird's eye view of my stone sink garden. Yes, I stress that word 'garden'. 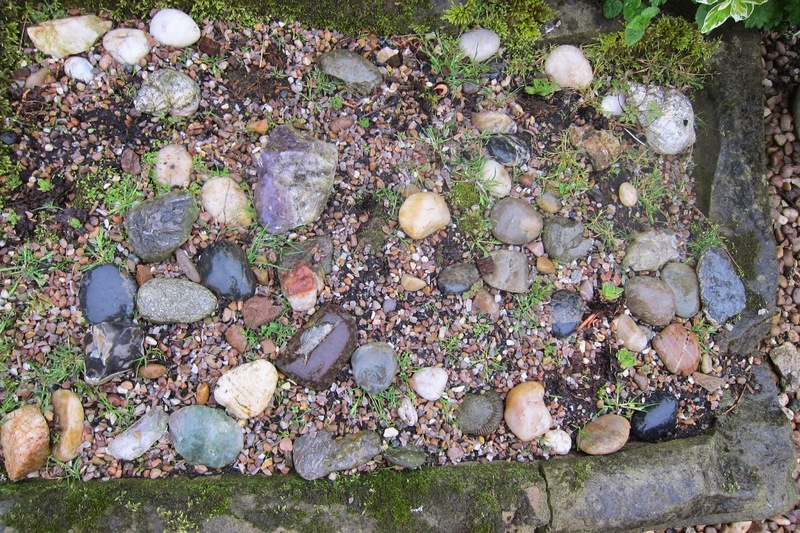 Although the gravel, pebbles, shells and fossils still remain after the winter, the 'garden' bit has totally vanished! It was full of house leeks, honest, last summer. I blame the pesky fantail doves as I think it was the equivalent of a salad bar for them through the lean winter months. Your garden looks beautiful Jane! 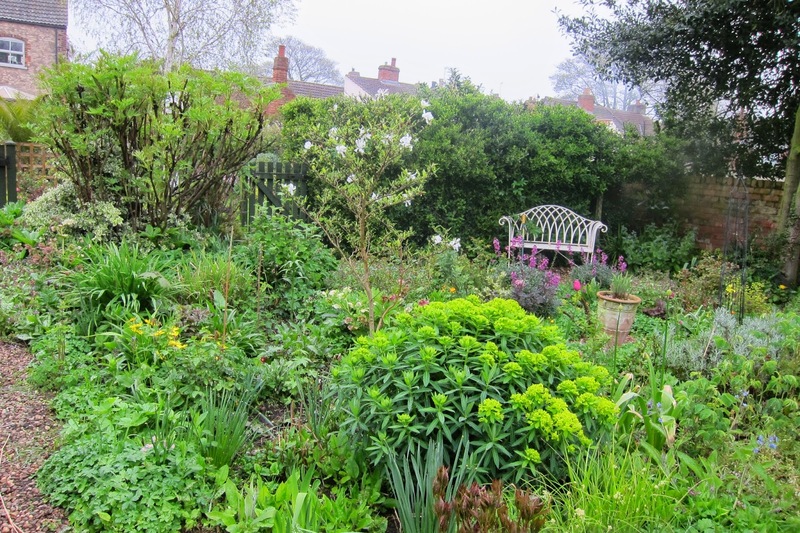 The borders surrounding the bench, the pond, all lovely! 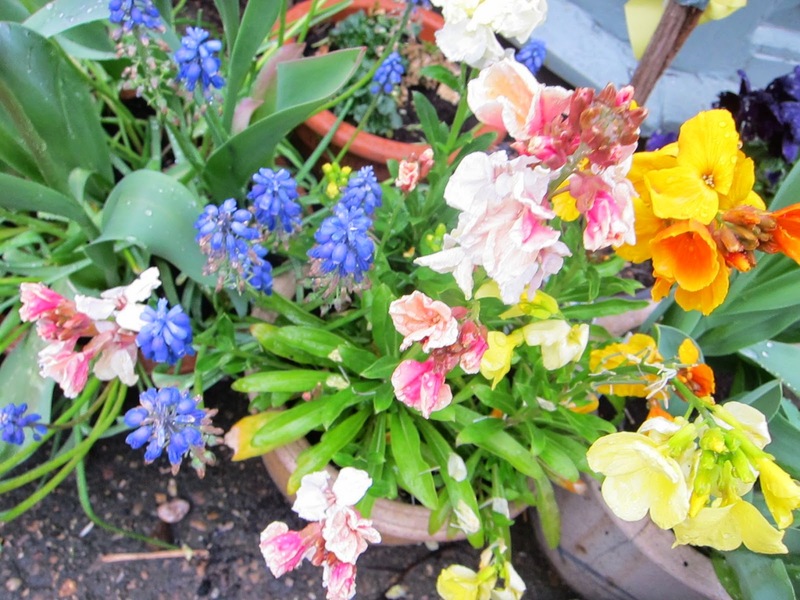 So much spring life and vibrancy in your garden and the rain just enhanced them. Thankyou Mark & Gaz, for your kind comments. 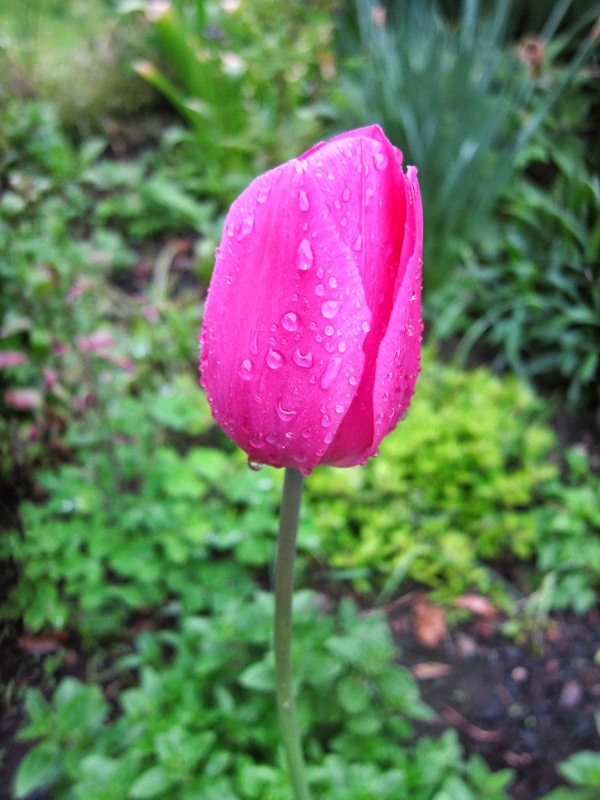 We have had continuous rain today but ... April showers bring May flowers, as they say, whoever 'they' are !! Your garden is so gorgeous. I am delighted with all the colors and plants from your garden.! Hi Ela, thankyou so much for your comments. It is a lovely time of year for colour ! Beautiful color and texture. All look so fresh! I love the natural pond on your garden. thanks for sharing me the beauty. Hi Endah thanks for your comments. Everything does look so fresh and new at this time of year,even the leaves on the tree are bright , and the grass is so green ... because of all the rain !! In spite of the stones, I think the look of your garden isn't so much a reason for cheerfulness, rather for ecstasy! Too kind Sue ! Everything always looks so good in April, before the wilt and flop of summer !! April and May are my favourite months in the garden, it is harder to keep it looking so fresh after that. 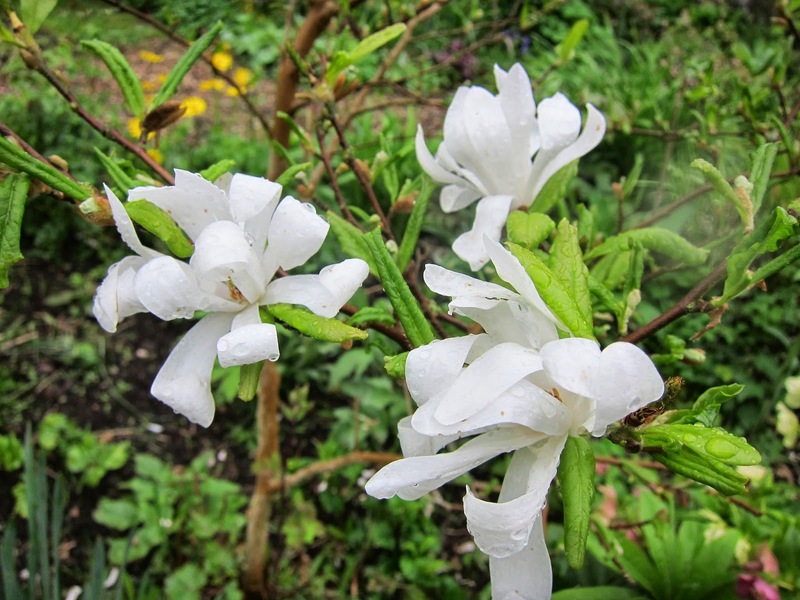 I love Magnolia Stellata, had it in a previous garden and must look out for one again. Mine too - there is a tipping point in mid-June and it is all downhill from there ! I love this bit, when it is all freshness and optimism ! You have lots of super foliage and flowers, everything is looking so good! Your pond is looking much better than mine, I really ought to get in it and sort some plants out that are getting far too big, but it will have to warm up first! 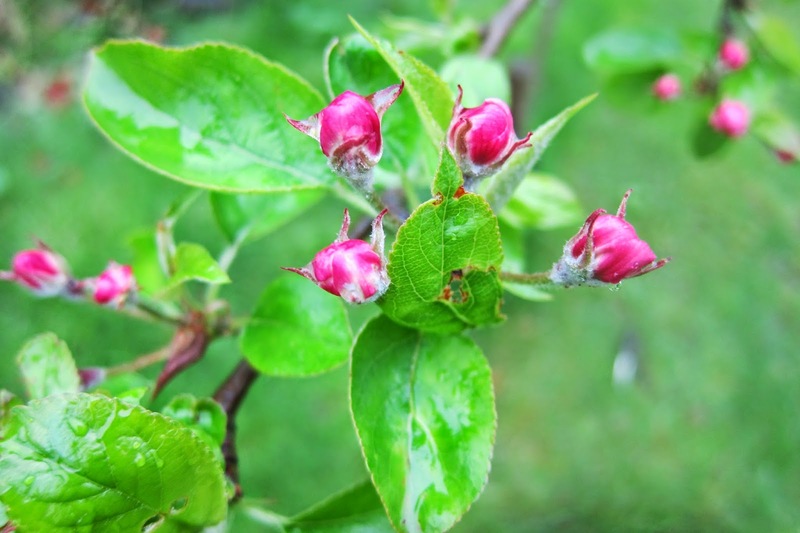 Our apple tree is covered in blossom too, lots of apples to cook with later! I must go and have a look to see if my Rodgersias have returned yet, I didn't notice them this morning. Hi pauline. 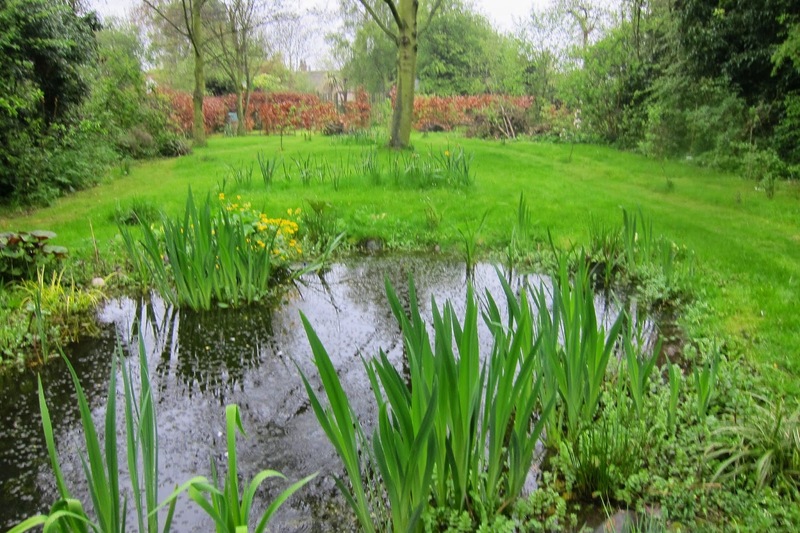 Ponds are difficult, it is difficult to get that balance right - it's either feast or famine as far as pond plants go! It never stays in balance for long ! Despite your stone sink garden, you have many reasons to smile. I just love how lush and healthy everything looks in spring, before all the problems start. How I wish I could grow Rodgersia! Another cooler climate plant that just doesn't do well here. Hi sarah, at this time of year it is smiles all round ! Rodgersia is a difficult customer to please, and I have had to move it around several times before it would do anything but sulk. It still sulks in dry summers, but goes berserk if we have a wet one - which is quite often !! Everything in your garden looks fresh and beautiful. This really is the best time of the year. I wish it would all slow down. I have never tried growing roses from seed, I am amazed that they flower so quickly. I think we are ahead of you, the Magnolia stellata is long gone and the apple blossom is full out. It is so beautiful and smells lovely. Hi Chloris, I was amazed how easy the roses were to grow from seed. The seed is pre-treated, stratified, I presume, which means they are much easier to germinate. I had a high success rate, and they are starting to flower now, from a January sowing. They are miniatures, about 25 cm tall, and great for edging. Thompson & Morgan do the seeds and I have a couple of blogs on their site about growing them. Your garden is looking so nice. The view across to the bench is especially lovely. It has been so cold here that there is still more brown than green. Daffodils are only peeking out of the soil. Soon hopefully soon spring will settle in. I like the leaves of your Rodgersia. Maybe this is the year I should add one to my garden. Hi jennifer - boy spring is late for you this year ! Is it always this late or is it due to your dreadful winter ? At least the daffy won't be long by the sound of it. I don't want to rub it in, but I think we are a couple of weeks ahead of the nom due to our unseasonably mild winter and spring. How gloriously spring-like Jane, all happy accidents are to be celebrated, and isn't "stellata" a wonderful plant? I am envious of your dahlia growth, I bought mine quite late this year (similar colours to yours) and they are being very slow to leaf up, no cuttings for me I fear. 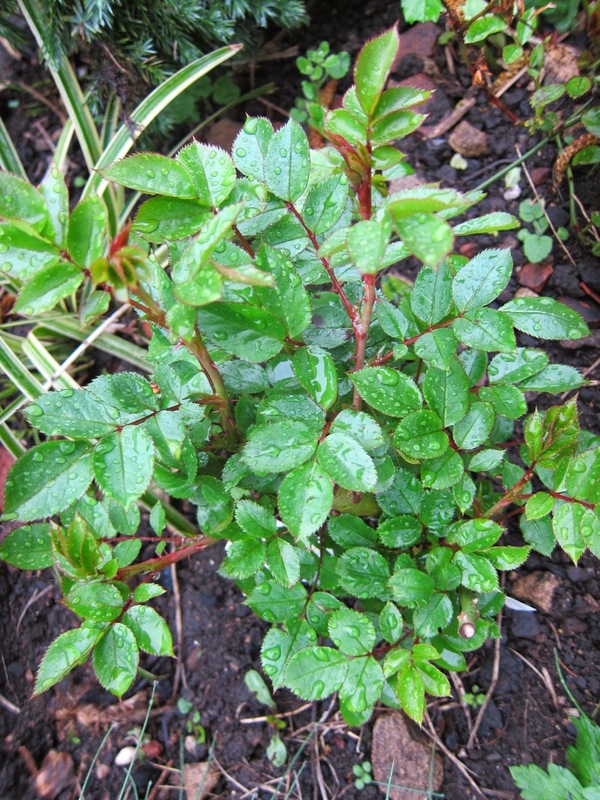 Glad to see your patio roses leafing up, I've been curious to see how they will look since you described planting them. Aren't beech buds strange? Glad too your new hedge is alive and well. Hi Janet. I have never taken dahlia cuttings, so am interested to know how you do it . Can I do it now ? Always good to have more dahlias - love them ! All the patio roses are looking good so far and I will be interested to see how they perform throughout the season, as I have never grown them before. Stellata is my best fave although I have just bought a tiny soulangeana which I will probably see flowering when I am in my dotage !! Gosh, moving house is a drastic way to avoid taking dahlia cuttings !! lol ! Seriously though, I am going to give it a go and follow your advice ! watch this space ! I thought I had left you a comment on this blog, but it would appear not. Wonderful Spring pictures but as far as the mildew is concerned in my damp shady conditions I now grow nothing which is remotely vulnerable if I can help it so I do not have a display of roses and have had to uproot my Photinia x fraseri 'Red Robin' after a couple of years as they would be absolutely devastated by black-spot. I have tried spraying in the past but I do not have the discipline now to spray at the recommended intervals, and even when I tried it never seemed to work. Sorry to be so negative, but I have now learned that if it doesn't work, scrap it and move on to something that does, saves all the heartache. Thanks for the advice Rick - 'the right plant for the right place' is a good mantra to garden by ! I don't think you are negative - just pragmatic! You can waste a lot of time, money and energy trying to keep an unhappy plant happy ! I had no idea that Photinia was prone to black spot btw ! Everything seems to bloom and grow for you so much sooner. Your fabulous garden is already looking lush and full. I have no advice on the mildew. When my plants get mildewy, I toss them, even if I'm cussing and crying the whole time. I've read it never truly goes away. However, if a plant only gets mildewy late in the season, I forgive it and give it a second chance. I still can't believe you grew roses from seed! Have your crocosmia come up yet? Our Spring is early this year, much earlier than it usually is, and I guess it is later for you ? Crocosmia is growing on strongly, and the roses are budding too, which is unheard of. I think I will end up chucking my roses out, even though I will be crying like a baby when I do so !! There are so many lovely and interesting things in your garden. 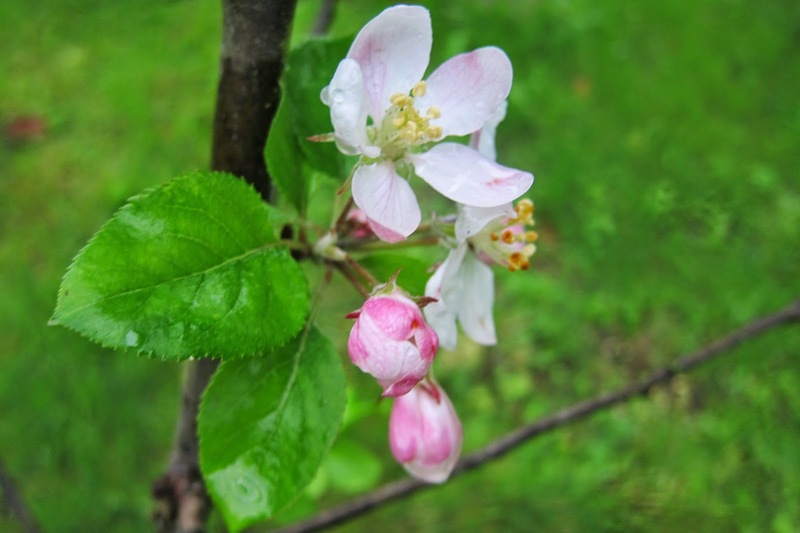 You have some beautiful spring flowers in bloom and of course the apple blossom is gorgeous. I'm glad to hear there's so much life in your pond, too. 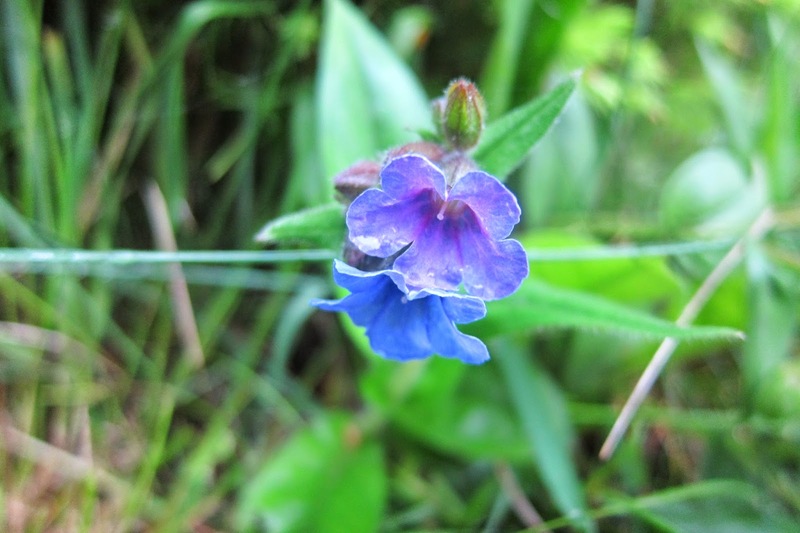 I've loved the pulmonaria here this year - I must plant some more for the future. Too kind, Wendy ! The pond is positively teeming with life, and saw a newt in it today, for the first time this season. I am fascinated by it ! I love Pulmonaria, it asks for so little! My favourite is the clear blue of 'Blue Ensign' but I also grow oodles of the self - seeding pink/ blue one too. Great post. The garden is a good place to go when you want to be happy.